The busy fall season calls for lots of cozy and fuss-free meals at our house. And if you’ve been around here for a while, you’ll know that I am a BIG time Instant Pot fan. Nothing gets dinner on the table quicker and easier than the Instant Pot. This Instant Pot Balsamic Chicken is the perfect comforting dish for busy weeknights. The chicken cooks up in under 30 minutes in the pressure cooker and is tender, juicy in a deliciously fresh and tangy lemony balsamic sauce. It’s packed with flavor and has a hint of sweetness from the tangy balsamic vinegar. I chose to serve the chicken with carrots, potatoes, and asparagus for an all in one complete meal for the family. This dish is paleo, Whole30 compliant and to keep this dish low carb and keto-friendly, you can serve the chicken with broccoli, cauliflower, zucchini or Brussels sprouts instead. You start off by seasoning the chicken with salt, black pepper and garlic powder. I used chicken thighs here because I love that they stay tender but I have also made this a number of times with chicken breasts and it still comes out super flavorful. Searing the chicken helps to seal in those amazing juices and gives the chicken that extra layer of flavor. Transfer to plate then add the butter, garlic, lemon juice, balsamic vinegar, Italian seasonoing and chicken broth. Add the vegetables, cover and lock the lid and let your pressure cooker do the rest. 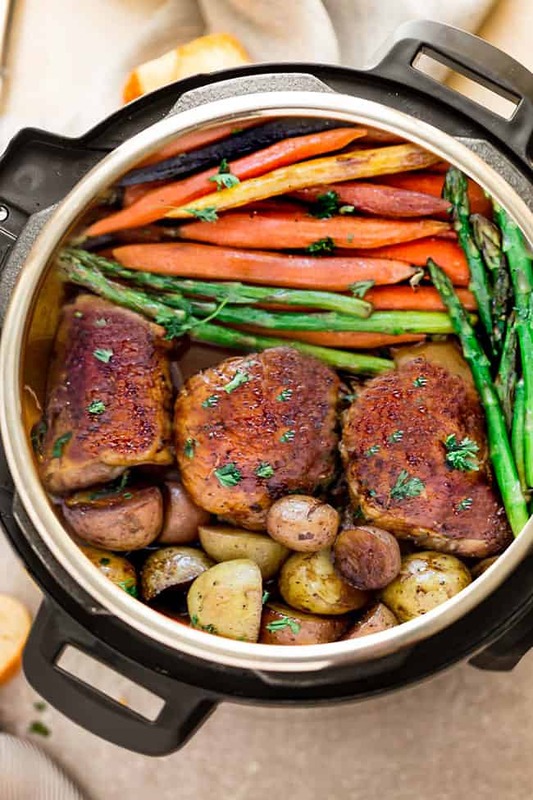 OPTIONAL STEP TO THICKEN THE SAUCE: If you want prefer your sauce on the thicker side, transfer the chicken and vegetables to a large serving platter then turn the Instant Pot to SAUTE mode. Add xanthan gum (or arrowroot starch for Paleo) and allow the sauce to simmer and thicken. Spoon sauce over chicken and vegetables. Garnish with parsley. IS THIS INSTANT POT BALSAMIC CHICKEN WHOLE 30, PALEO OR KETO-FRIENDLY? Yes. This easy balsamic chicken is paleo friendly and Whole 30 compliant. 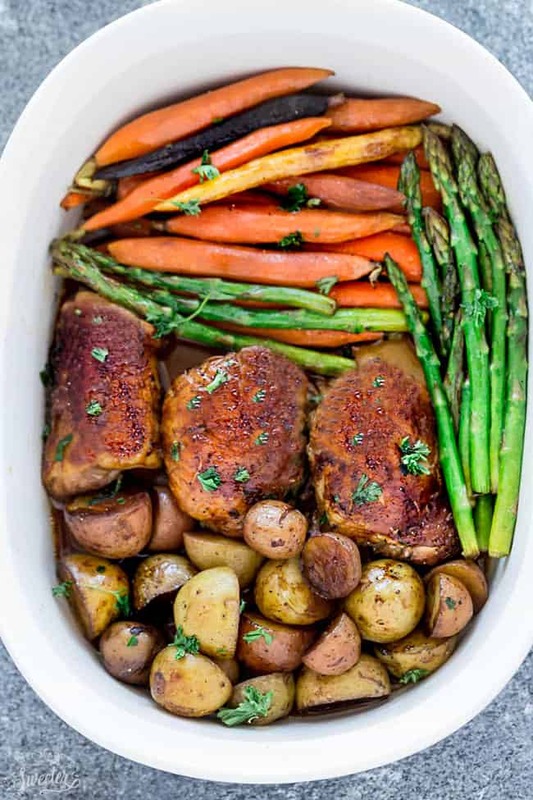 And if you serve the chicken with low carb vegetables like asparagus, cauliflower, Brussels sprouts, sauteed spinach or broccoli, this recipe fits perfect into a ketogenic lifestyle. IS INSTANT POT CHICKEN FREEZER-FRIENDLY? Yes. The great thing about making chicken in a multi-cooker is that you can make a big batch ahead of time on your meal prep Sunday and freeze it for later. Allow the chicken to cool down. Store separately from the sides in an airtight container or freezer-friendly zip-top bags. 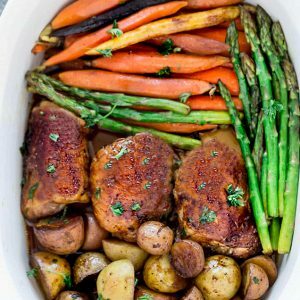 WHAT ELSE CAN I SERVE WITH INSTANT POT BALSAMIC CHICKEN? This instant pot balsamic chicken would be delicious on its own but also goes well with so many sides. 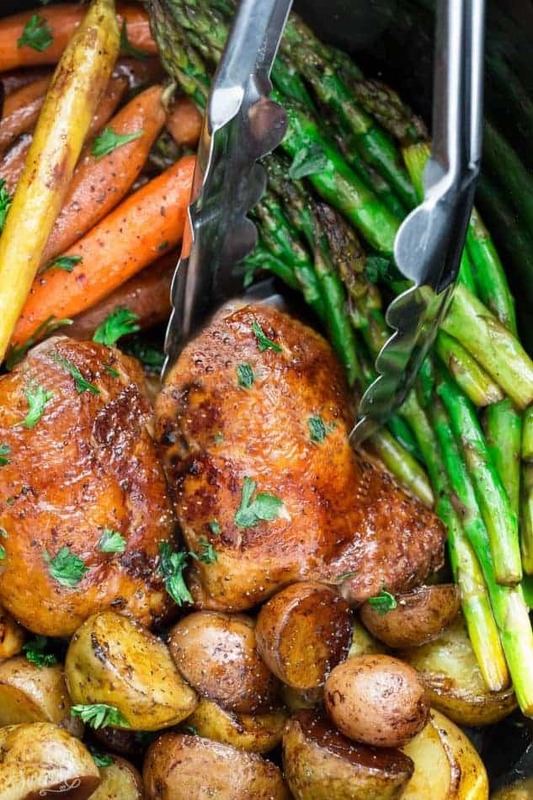 A few great options include honey roasted carrots, garlic potatoes, and roasted asparagus. Feel free to use whatever vegetables that you have in your fridge or pantry. Also, if you are looking for a heartier meal, it would go perfectly over a plate of pasta, Instant Pot quinoa or this Instant Pot rice. Instant Pot Balsamic Chicken is the perfect easy one pan meal for busy weeknights. Best of all, this pressure cooker chicken recipe cooks up tender, juicy and full of flavor with instructions for the Instant Pot & stovetop. Season the chicken with salt, pepper, garlic powder and Italian seasoning. Place chicken in the Instant Pot and cook on each side for 4-5 minutes, or until golden brown. This helps to seal in the juices and keep it tender. (You may have to work in batches depending on the size and amount of chicken you are using). Once browned, carefully remove the chicken and place on a plate. Melt ghee (or butter) in Instant Pot and stir in the garlic. Add lemon juice and balsamic vinegar to deglaze the pan and cook for 1 minute. Add Italian seasoning and chicken broth. Use tongs to add the chicken back into the pot. Add the carrots and potatoes. Sprinkle with salt and pepper. Cover and lock the lid, then turn the valve to SEALING. Select the Manual (older models) or Pressure Cook (newer models) button and adjust the timer to 4 minutes. When done, let the pressure release naturally for 10 minutes and then push the valve to VENTING. Remove the lid. Remove chicken, potatoes and carrots from Instant Pot and set aside on a large serving plate. To thicken the sauce (OPTIONAL), press CANCEL then SAUTE. Add the asparagus and cook for 2-3 minutes, or until tender. Transfer to the same serving plate as the chicken. To thicken sauce, stir in xanthan gum (or arrowroot starch slurry for Paleo) and allow to simmer and bubble, about 2-3 minutes. Spoon sauce over chicken and vegetables and garnish with chopped parsley. Return pan back to heat and melt ghee (or butter)r. Stir in the garlic. Add lemon juice and balsamic vinegar to deglaze pan and cook for 1 minute. Add Italian seasoning and chicken broth. Add the chicken back into the pan until hot. Spoon sauce over chicken and sprinkle with chopped parsley and serve hot with your favorite sides. Love using my instant pot! we love the lemon chicken so will be trying this soon! Thanks! This was delicious! We Served with CAULIFLOWER rice. A keeper. Thanks! My whole family gObbled this uP so fast! Loved the FlaVor, thank you! Does the calorie count include the entire receipe or just the chicken? This was a 4 thumbs up from my crew!! We loved every bite!! This is the first dish i’ve made in my instant pot and it was absolutely delicious!!! I will definitely be making this again!